Welcome to Le Gatinaud Cottage, a stylish detached French holiday gite. 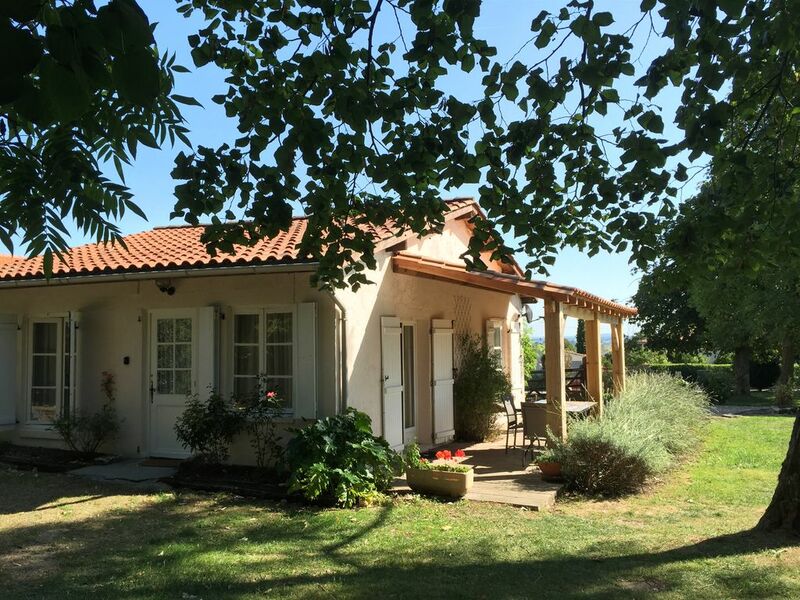 Perfect for escaping the stresses and cares of a busy life or to use as a base for house-hunting in the beautiful Dordogne and Southern Charente. The cottage is located in a peaceful hamlet of just five properties. It is decorated and furnished to provide all the comforts of home in a classic French country style. French doors open on to a South-facing, covered terrace that is the perfect place to enjoy the far-reaching views and a glass of wine on warm evenings. Tree-slung hammocks inside the fully enclosed garden are the perfect spot to relax in the shade or stargaze in the evenings. TV with Freesat Tuner for UK channels, DVDs and books. CD/Radio/i-pod dock (please bring our own charging lead). Free Wi-Fi available. We pride ourselves on offering not only a great location to explore the Charente, Dordogne and Maritime region, but also a peaceful, welcoming holiday home. Please do not hesitate to call or email me to enquire about availability or anything else we can help you with. Hello, we are David & Elaine Courtney. We have a teenager daughter who will soon start University. We bought Le Gatinaud Cottage in 2008 after visiting friends in this area. We all value the times we've spent at the cottage and always leave feeling rested and relaxed. We love visiting France and were captivated with the beautiful countryside views and found spending time in this region of France very relaxing. The rolling hills and sunflower fields really let you feel as though you're "getting away from it all", especially the daily commute! Upon arrival, we can almost feel the stress melting away when we first see the view from the garden. The relaxation continues with a walk along the River Dronne, just 5 minutes away. River beaches, swimming, canoeing, tennis and golf are just a few of the activities available within a 10 minute drive. Also ideally located for exploring the Dordogne, Charante and Maritime coast. The cottage is located in a peaceful hamlet of just five properties. The tree-slung hammocks inside the fully enclosed garden are the perfect spot to relax in the shade or stargaze in the evenings. We pride ourselves on offering not only a great location to explore the Charente, Dordogne and Maritime region, but a peaceful, welcoming holiday home. There is an en-suite bathroom and WC to the main bedroom and an en-suite shower room and WC to the single bedroom. Electric towel heaters to both rooms. There is a spacious double height open-plan living room, dining room & kitchen area. The living room has French windows opening onto a private, South-facing terrace. For evenings there is a TV with Freesat Tuner for UK channels, DVDs and books. The newly refurbished kitchen has a gas cooker, large fridge-freezer, dishwasher, microwave and washing machine. Fully enclosed garden with mature trees and shrubs, wonderful views of the surrounding countryside. Tree slung hammocks offer a place to relax in the shade or to stargaze in the evenings. We had a wonderful stay in this beautiful cottage. Loved the garden, and spent a lot of time there. It was a lovely week weather-wise, and therefore perfect to enjoy the beautiful, private garden. It was good to have sun and shade to choose from. Both inside and out, we appreciated the quality of the fittings - the very comfy outdoor loungers, the kitchen equipment, the range of movies! Basically, there were no snags, with everything from the shower to the cooker working perfectly. And a very detailed guide to everything in the cottage, which was a help. We went out each day to the lovely local markets and especially Aubeterre, but it was always great to get back to the cool of the garden with its amazing views. The local boulangerie was very handy, and we visited it every day. Take note that you have to either get there early (before 10am), or as we did, order it from day to day. Would certainly book this cottage again, and recommend it to others! Thank you, for taking the time to write this lovely review. It was good to hear that the weather was kind to you and that you had a wonderful stay at the cottage and enjoyed the local area. We would be delighted to welcome you back again. We hope you enjoyed the next stage of your holiday and had a good trip home. Peaceful relaxing time in a quiet rural situation. The neighbours were pleasant and helpful and the village close by. Superb family run local Auberge with reasonably priced food and drinks. The surrounding area was scenic and other villages interesting. The listing description was accurate, clean and welcoming and would recommend this property to friends and/or relatives. We look forward to returning. ,The cottage is very comfortable, great for two or three guests, although we spent nearly all our time outside enjoying the gorgeous view as the weather was perfect,. It was well situated for visiting local towns, where we always found a good restaurant, and for taking a stroll round the village and farms to stretch our legs. Canoeing and swimming were available 5 minutes away (yes, you can try new things in your 50s, never canoed down a river before! ), and the friendliness of the neighbours, and their cats and dogs, topped our week off perfectly. Thank you for your kind words, we are glad that found it as peaceful and relaxing as we do. We would be delighted to welcome you back in the future. The property is small but charming. It is in a beautiful location with a large garden overlooking beautiful countryside. It is well maintained and immaculately clean. The facilities are excellent. Elaine provides excellent customer service. Only small drawbacks are no WiFi and the kitchen is rather dark when the lights are off. This has been addressed by very well lit new kitchen units. There is a boulangerie and a pizza restaurant in the village but the other restaurant is now closed. Aubeterre and St Aulaye are nearby and provide many supermarkets, restaurants, interesting shops etc. The surrounding coutryside provides excellent walks and bike riding opportunities. I would definitely recommend this cottage to friends and relatives as an ideal peaceful getaway. 1 hr 15 mins to the Charente Maritime coastline with beautiful sandy beaches, historic seaside villages and popular resorts. 1 hour from Bergerac airport (Flights from Stansted, Southampton, Bristol). Poitiers and Limoges are approximately 2 hours drive. 50 minutes to Périgueux, fabulous old town with boutique shops and restaurants. About the climate: We're right down in the South-West of France where the sun is much higher in the sky all year round. We get lots of sunshine throughout the year and just enough rain to keep it green and pleasant. Spring comes early and temperatures can be in the 20's from March onwards. Summer is warm, with highs in the 30's, but as we are perched up on a hill we often get a breeze to keep things fresh. Autumn can stay warm in the day, but with cooler nights. Even in winter when the sun is out it's possible to sit outside in the middle of the day and enjoy a glass of St Emilion. Booking Notes: To secure the booking we ask for 25% of the rental cost as a deposit. The remaining balance, the £250 refundable damage deposit and the Taxe de Sejour would be due six weeks before the start of your holiday. The refundable damage deposit will be returned within 28 days of your departure subject to a satisfactory property inspection. Changeover Day: Saturday change-over. Notes on prices: All prices are per week Saturday to Saturday arriving at 4pm and departing at 10am. Prices include bed linen, (towels can be made available at an additional cost), gas and electricity (usage over a set amount will be charged). No smoking. No pets allowed.